This week I made Fondant Fancies or better known as French fancies. This was one of my hardest bakes so far because as I found it very difficult to cover the cake with the fondant icing as well as getting the icing to the right consistency. I also had problems with the cake splitting in half when I was putting the icing on the cake and this meant I had lots of cake crumbs in the icing bowl making my fancies look messy. The actual bake went well and found putting the marzipan on the sponge fun. I’m not very happy with my bake this week so I am going to try it again for my next blog. French Fancies are a Mr Kipling invention and were one of the 20 cakes that were launched by Mr Kipling when he first started in 1967 and then in 2008 Mr Kipling made a big party french fancy cake. 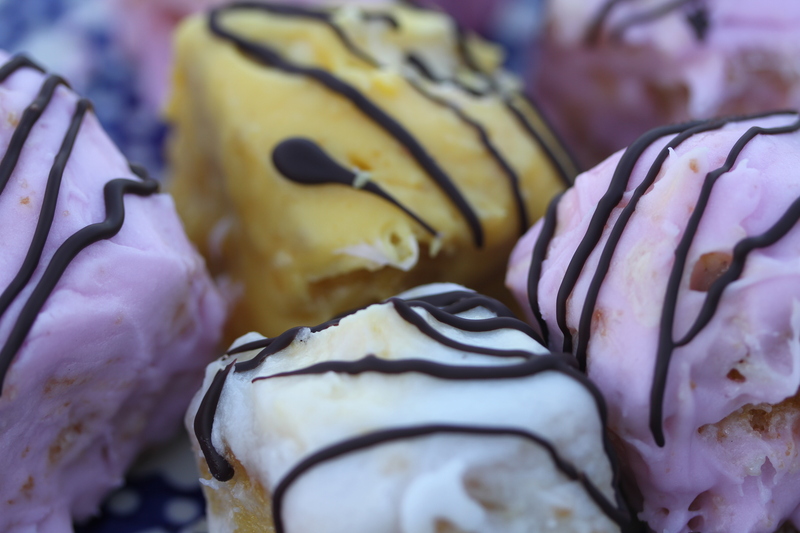 French fancies and fondant fancies are the same . Fondant fancies are what supermarkets and homebakers call their cakes and French Fancies are what Mr Kipling calls his.